Liverpool-headquartered developer, YPG, has been given the green light to transform a disused Wirral Council building, adjacent to the Grade 1 listed Hamilton Square. Located on the corner of Cleveland Street and Lord Street, the £12m complex will be called Hamilton Hub and breathe new life into the surrounding Birkenhead area. Plans will see the existing building expanded to 70,000 sq ft and refurbished to feature key amenities, including a gym and laundry facilities. 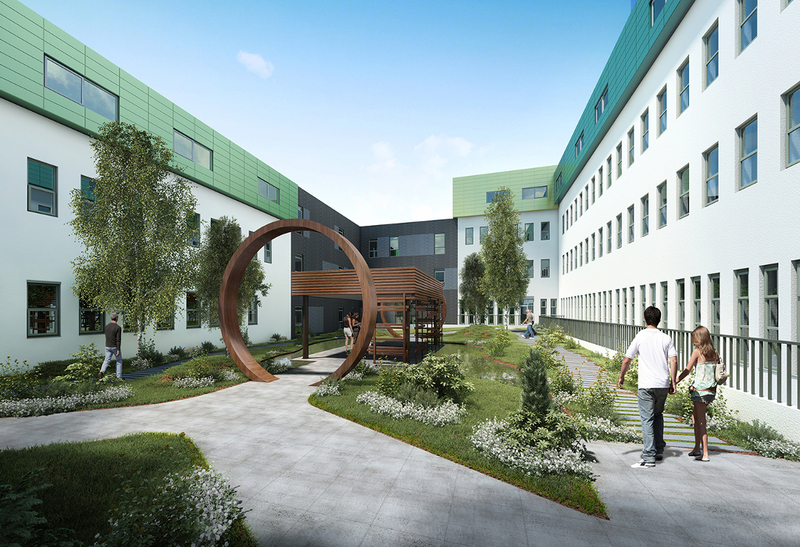 There will also be a communal secret garden and rooftop extension, which will take the complex from two and three storeys to between three and five storeys. The regeneration-focused property company is set to start on site imminently. YPG Projex has designed the building and YPG Developments will be building the complex itself. Construction work is expected to provide around 100 employment opportunities, with YPG committed to supporting the local supply chain wherever possible, and working with the Wirral Chamber of Commerce to this end. Ming Yeung, Managing Director of YPG, said: “Knowledge-intensive sectors and higher-education establishments are vital regeneration catalysts for both Wirral and the wider Liverpool City Region. “At YPG we’re well versed in providing student accommodation to support these industries. We listen closely to our customers’ feedback, and the green space afforded by the secret garden and the rooftop extension at Hamilton Hub are based on this. The development will support the Marine Education and Training Centre being developed in Wirral as part of the new Mersey Maritime Knowledge Hub, providing high-quality accommodation for its students. The Knowledge Hub is being developed by Wirral Council in partnership with Liverpool John Moores University, Mersey Maritime and Peel Ports. It is set to be a globally-significant location for incubation, teaching and R&D in the sector. Councillor Phil Davies, leader of Wirral Council, said: “This is yet more proof that Birkenhead is once again becoming the vibrant, thriving town we all remember. This latest news follows last week’s announcement that YPG is to open a new luxury 50-bedroom hotel in the Liverpool ONE shopping complex, complete with a restaurant and rooftop bar.